Cody Simpson Web is proud to present a very new and exciting feature to the site, continuing with the 1 year online celebration, Simpsonizer Magazine! 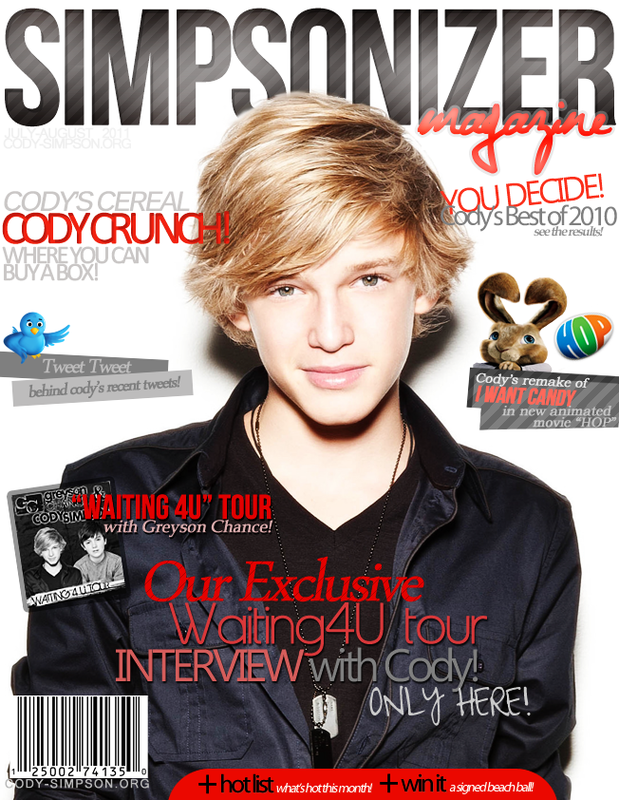 Simpsonizer Magazine is a free, online magazine for Cody Simpson fans. Simpsonizer Magazine was made exclusively for Cody Simpson Web and made by the staff of Cody Simpson Web especially for Cody Simpson and his fans. This issue took a lot to finish, but the work definitely payed off! We’re so excited to finally release this feature to you! We will do our best to keep this as an updated feature, meaning we will do our best to keep bringing you new issues every other month! Next issue should be around September! Click the image below to view the current issue! We would like to thank Cody for his contribution towards our first issue for giving us a small online interview with him from his recent tour with Greyson Chance. You can ONLY find it here, so make sure you check out the magazine to read it! Make sure to follow the magazine’s Twitter @SimpsonizerMag for upcoming issues, magazine updates, and more! Also PLEASE share this with your friends by clicking on the Tweet button or Faceboook button below! We hope you enjoy this exciting new feature, and keep checking back for more updates! PreviousTAMPA FANS! VOTE FOR CODY TO BE AT THE 93.3 FLZ JINGLE BALL 2011!